American lunar orbiter. Photography of the moon's surface from selenocentric orbit. The Lunar Orbiter series took photos of lunar surface from selenocentric orbit. Lunar lander built by Boeing for NASA, USA. Launched 1966 - 1967. Status: Operational 1966. First Launch: 1966-08-10. Last Launch: 1967-08-01. Number: 5 . Gross mass: 388 kg (855 lb). The lunar orbiter used a film scanning process taken from a classified program and returned high-resolution images of the surface back to Earth. These images were vital to planning of the subsequent Surveyor and Apollo lunar landings. Family: Lunar Orbiters, Moon. Country: USA. Engines: R-4D. Launch Vehicles: Atlas, Atlas Vega, Atlas SLV-3 Agena D. Launch Sites: Cape Canaveral, Cape Canaveral LC13. Agency: NASA, Boeing. Bibliography: 16, 2, 278, 279, 3846, 3847, 3848, 3849, 3850, 3851, 3852, 3853, 3854, 3855, 3856, 3857, 3858, 3859, 3860, 3861, 3862, 3863, 3864, 3865, 6, 6662, 12782. 1959 May 9 - . LV Family: Atlas. Launch Vehicle: Atlas Vega. High-resolution photographs of the moon using Vega rocket - . Nation: USA. Related Persons: Rosen, Milton. Program: Apollo. Spacecraft: Lunar Orbiter. 1963 March 14 - . 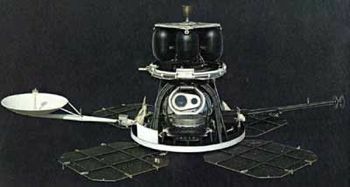 Unmanned lunar orbiter spacecraft - . Nation: USA. Program: Apollo. Spacecraft: Lunar Orbiter. Homer E. Newell, Director of NASA's Office of Space Sciences, summarized results of studies by Langley Research Center and Space Technology Laboratories on an unmanned lunar orbiter spacecraft. These studies had been prompted by questions of the reliability and photographic capabilities of such spacecraft. Both studies indicated that, on a five-shot program, the probability was 0.93 for one and 0.81 for two successful missions; they also confirmed that the spacecraft would be capable of photographing a landed Surveyor to assist in Apollo site verification. Lunar Orbiter program approved - . Nation: USA. Related Persons: Seamans. Program: Apollo. Spacecraft: Lunar Orbiter. NASA Associate Administrator Robert C. Seamans, Jr., approved the Lunar Orbiter program. Objectives of the program were reconnaissance of the moon's topography, investigation of its environment, and collection of selenodetic information. The document called for five flight and three test articles. The Lunar Orbiter spacecraft would be capable of photographing the moon from a distance of 22 miles above the surface. Overall cost of the program was estimated at between $150 and $200 million. Boeing Company to build five Lunar Orbiter spacecraft - . Nation: USA. Program: Apollo. Spacecraft: Lunar Orbiter. NASA selected The Boeing Company to build five Lunar Orbiter spacecraft. Beginning in 1966, Lunar Orbiters would take close-range photographs of the moon and transmit them by telemetry back to earth. The spacecraft would also detect radiation and micrometeoroid density and supply tracking data on the gravitational field of the moon. Information derived from the project (managed by Langley Research Center) would aid in the selection of lunar landing sites. 1964 March 25 - . Boeing to develop the Lunar Orbiter spacecraft - . Nation: USA. Program: Apollo. Spacecraft: Lunar Orbiter. to expand the area of photographic coverage, the film capacity was increased. 10 areas on the moon selected as subjects for Lunar Orbiter - . Nation: USA. Program: Apollo. Spacecraft: Lunar Orbiter. NASA announced that it had selected 10 areas on the moon as subjects for Lunar Orbiter's cameras during 1966. These areas encompassed most major types of lunar terrain. Most were suitable - and potential - landing sites for Surveyor and Apollo spacecraft..
Lunar Orbiter program status - . Nation: USA. Related Persons: Faget. Program: Apollo. Spacecraft: Lunar Orbiter. MCC's Robert R. Gilruth, Maxime A. Faget, and William E. Stoney visited Langley Research Center to discuss the Orbiter program status and plans for distributing photos obtained from Orbiter with Floyd Thompson, Charles Donlan, and other Langley personnel members connected with the Orbiter program. Important aspects of the program were presented, with particular emphasis on the camera system and the kind and quality of photography to be obtained. In the discussion of data handling it was apparent there were no conflicts of purpose or planned activity between LaRC and MSC. It was determined that strong MSC representation at Langley during the photo screening period would be advantageous to MSC and of great benefit in MSC's subsequent lunar landing site evaluation. 1966 August 10 - . 19:26 GMT - . Launch Site: Cape Canaveral. Launch Complex: Cape Canaveral LC13. LV Family: Atlas. Launch Vehicle: Atlas SLV-3 Agena D.
Lunar Orbiter 1 - . Payload: Lunar Orbiter A. Mass: 386 kg (850 lb). Nation: USA. Agency: NASA Langley. Class: Moon. Type: Lunar probe. Spacecraft: Lunar Orbiter. Decay Date: 1966-10-29 . USAF Sat Cat: 2394 . COSPAR: 1966-073A. Lunar Orbiter I was launched from Cape Kennedy Launch Complex 13 at 3:26 p.m. EDT August 10 to photograph possible Apollo landing sites from lunar orbit. The Atlas-Agena D launch vehicle injected the spacecraft into its planned 90-hour trajectory to the moon. A midcourse correction maneuver was made at 8 p.m. the next day; a planned second midcourse maneuver was not necessary. A faultless deboost maneuver on August 14 achieved the desired initial elliptic orbit around the moon, and one week later the spacecraft was commanded to make a transfer maneuver to place it in a final close-in elliptic orbit of the moon. During the spacecraft's stay in the final close-in orbit, the gravitational fields of the earth and the moon were expected to influence the orbital elements. The influence was verified by spacecraft tracking data, which showed that the perilune altitude varied with time. From an initial perilune altitude of 58 kilometers, the perilune decreased to 49 kilometers. At this time an orbit adjustment maneuver began an increase in the altitude, which was expected to reach a maximum after three months and then begin to decrease again. The spacecraft was expected to impact on the lunar surface about six months after the orbit adjustment. During the photo-acquisition phase of the flight, August 18 to 29, Lunar Orbiter I photographed the 9 selected primary potential Apollo landing sites, including the one in which Surveyor I landed; 7 other potential Apollo landing sites; the east limb of the moon; and 11 areas on the far side of the moon. Lunar Orbiter I also took photos of the earth, giving man the first view of the earth from the vicinity of the moon (this particular view has been widely publicized). A total of 207 frames (sets of medium- and high-resolution pictures) were taken, 38 while the spacecraft was in initial orbit, the remainder while it was in the final close-in orbit. Lunar Orbiter I achieved its mission objectives, and, with the exception of the high-resolution camera, the performance of the photo subsystem and other spacecraft subsystems was outstanding. At the completion of the photo readouts, the spacecraft had responded to about 5,000 discrete commands from the earth and had made about 700 maneuvers. Photographs obtained during the mission were assessed and screened by representatives of the Lunar Orbiter Project Office, U.S. Geological Survey, DOD mapping agencies, MSC, and Jet Propulsion Laboratory. The spacecraft was deliberately crashed into moon after the mission was completed. 1966 October 4 - . Lunar Orbiter 1 results - . Nation: USA. Program: Apollo. Spacecraft: Lunar Orbiter. MSC Director Robert R. Gilruth told Langley Research Center Director Floyd Thompson, "Lunar Orbiter I has made significant contributions to the Apollo program and to lunar science in general. Details visible for the first time in Orbiter I photographs will certainly add to our knowledge of the lunar surface and improve our confidence in the success of the Apollo landing. "Screening teams . . . are studying the photographs as they become available at the Lunar Orbiter Project Office, Langley Research Center. Several promising areas for Apollo landing sites have been studied here in Houston by the screening teams and will be studied in more detail later. This preliminary study has already influenced the selection of sites to be photographed on the next Orbiter mission. . . ."
1966 November 6 - . 23:21 GMT - . Launch Site: Cape Canaveral. Launch Complex: Cape Canaveral LC13. LV Family: Atlas. Launch Vehicle: Atlas SLV-3 Agena D.
Lunar Orbiter 2 - . Payload: Lunar Orbiter B. Mass: 390 kg (850 lb). Nation: USA. Agency: NASA Langley. Class: Moon. Type: Lunar probe. Spacecraft: Lunar Orbiter. Decay Date: 1967-10-11 . USAF Sat Cat: 2534 . COSPAR: 1966-100A. Lunar Orbiter II was launched at 6:21 p.m. EST from Launch Complex 13 at Cape Kennedy, to photograph possible landing sites on the moon for the Apollo program. The Atlas-Agena D booster placed the spacecraft in an earth-parking orbit and, after a 14-minute coast, injected it into its 94-hour trajectory toward the moon. A midcourse correction maneuver on November 8 increased the velocity from 3,051 to 3,133 kilometers per hour. At that time the spacecraft was 265,485 kilometers from the earth. The spacecraft executed a deboost maneuver at 3:26 p.m., November 10, while 352,370 kilometers from the earth and 1,260 kilometers from the moon and traveling at a speed of 5,028 kilometers per hour. The maneuver permitted the lunar gravitational field to pull the spacecraft into the planned initial orbit around the moon. On November 15, a micrometeoroid hit was detected by one of the 20 thin-walled pressurized sensors. The spacecraft was transferred into its final close-in orbit around the moon at 5:58 p.m. November 15 and the photo-acquisition phase of Lunar Orbiter II 's mission began November 18. Thirteen selected primary potential landing sites and a number of secondary sites were to be photographed. By the morning of November 25, the spacecraft had taken 208 of the 211 photographs planned and pictures of all 13 selected potential landing sites. It also made 205 attitude change maneuvers and responded to 2,421 commands. The status report of the Lunar Orbiter II mission as of November 28 indicated that the first phase of the photographic mission was completed when the final photo was taken on the afternoon of November 25. On November 26, the developing web was cut with a hot wire in response to a command from the earth. Failure to achieve the cut would have prevented the final readout of all 211 photos. Readout began immediately after the cut was made. One day early, December 6, the readout terminated when a transmitter failed, and three medium-resolution and two high-resolution photos of primary site 1 were lost. Full low-resolution coverage of the site had been provided, however, and other data continued to be transmitted. Three meteoroid hits had been detected. 1967 February 5 - . 01:17 GMT - . Launch Site: Cape Canaveral. Launch Complex: Cape Canaveral LC13. LV Family: Atlas. Launch Vehicle: Atlas SLV-3 Agena D.
Lunar Orbiter 3 - . Payload: Lunar Orbiter C. Mass: 385 kg (848 lb). Nation: USA. Agency: NASA Langley. Class: Moon. Type: Lunar probe. Spacecraft: Lunar Orbiter. Decay Date: 1967-10-09 . USAF Sat Cat: 2666 . COSPAR: 1967-008A. Crashed into Moon; returned 182 photos of lunar surface. Selenocentric orbit. Spacecraft engaged in research and exploration of the upper atmosphere or outer space (US Cat B)..
1967 May 4 - . 22:25 GMT - . Launch Site: Cape Canaveral. Launch Complex: Cape Canaveral LC13. LV Family: Atlas. Launch Vehicle: Atlas SLV-3 Agena D.
Lunar Orbiter 4 - . Payload: Lunar Orbiter D. Mass: 390 kg (850 lb). Nation: USA. Agency: NASA Langley. Class: Moon. Type: Lunar probe. Spacecraft: Lunar Orbiter. Decay Date: 1967-10-06 . USAF Sat Cat: 2772 . COSPAR: 1967-041A. Returned 163 photos of lunar surface before impacting Moon. Selenocentric orbit. Spacecraft engaged in research and exploration of the upper atmosphere or outer space (US Cat B)..
1967 August 1 - . 22:33 GMT - . Launch Site: Cape Canaveral. Launch Complex: Cape Canaveral LC13. LV Family: Atlas. Launch Vehicle: Atlas SLV-3 Agena D.
Lunar Orbiter 5 - . Payload: Lunar Orbiter E. Mass: 389 kg (857 lb). Nation: USA. Agency: NASA Langley. Class: Moon. Type: Lunar probe. Spacecraft: Lunar Orbiter. Decay Date: 1968-01-31 . USAF Sat Cat: 2907 . COSPAR: 1967-075A. Lunar Orbiter V was launched from the Eastern Test Range at 6:33 p.m. EDT August 1. The Deep Space Net Tracking Station at Woomera, Australia, acquired the spacecraft about 50 minutes after liftoff. Signals indicated that all systems were performing normally and that temperatures were within acceptable limits. At 12:48 p.m. EDT August 5, Lunar Orbiter V executed a deboost maneuver that placed it in orbit around the moon. The spacecraft took its first photograph of the moon at 7:22 a.m. EDT August 6. Before it landed on the lunar surface on January 31, 1968, Lunar Orbiter V had photographed 23 previously unphotographed areas of the moon's far side, the first photo of the full earth, 36 sites of scientific interest, and 5 Apollo sites for a total of 425 photos.